Blurb : What waits in the ruined Dwarf Stronghold: Two hundred years ago, the great dwarvern smith Durgeddin the Black built Khundrukar, a hidden stronghold for his war of vengence against all orckind. For years Durgeddin laboured, until the orcs discovered Khundrukar and stomed the citadel, slaying all within. Ledgends say that Durgeddin's masterful blades and glittering treasures were never found. The Sunless Citadel is a stand alone adventure for the Dungeons & Dragons game. It details Khundrukar's five extensive levels of fierce tribes, dangerous obstacles diabolical traps, monsterous creatures. The Module : The second of a series of eight stand alone adventures this is another straight forward, good old fashioned dungeon bash. I find the adventure itself, although good, less original than the first of the series, "The Sunless Citadel". The subject of abandoned Dwarvern strongholds is as old Tolkien, indeed I review two other excellent examples on this site, "The Awakening" and "The Complete Dungeon Master Series". 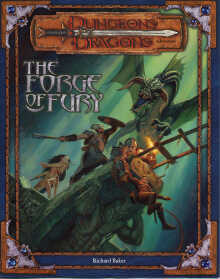 TSR also released an adventure called "Under Illefarn", (I think), for 0th level characters to start them off in a Forgotton Realms campaign with a similar plot. The job has been done well though, with the PC's encountering different power groups as they venture deeper into the dungeon. I havn't played this yet, but on first reading I think it's quite tough, no very tough. the characters are expected to progress to 5th level by the end of it but my mind says that the final encounters will be fought by four 4th level PC's ... wow! Again the layout, artwork and maps are excellent particularly the, style being very much the same as the first module. This is very much a "Ready-to-Run" adventure, one read through and the DM can start to play. A very good appendix gives a summary of the monsters encountered and magic item details. Good Points : Good ready-to-run adventure, very well laid out. Great artwork and maps. Bad Points : Too tough? A little un-original and long term DM's may well have run this theme before. The cover, which has the maps printed on the inside, does not separate from the rest of the module for ease of reference. Other Notes : The scenario is designed for 4 1st level PC's, which is a departure from the traditional 6-8 format. I wonder if WoC have done any research on the average number of party members in a typical gaming group?